Yum! Melissa shared this breadstick recipe with me. They are light and fluffy and easy and my family loved them! In a large bowl, or in the bowl of a stand-mixer, add warm water, instant yeast, sugar and salt. Stir to combine (using the dough hook if in the stand-mixer) Add 2 cups flour and mix well. Gradually add in the rest of the flour until dough pulls away from the sides of the bowl and sticks to your finger a little bit. (Remember to only add up to 4 cups flour total. 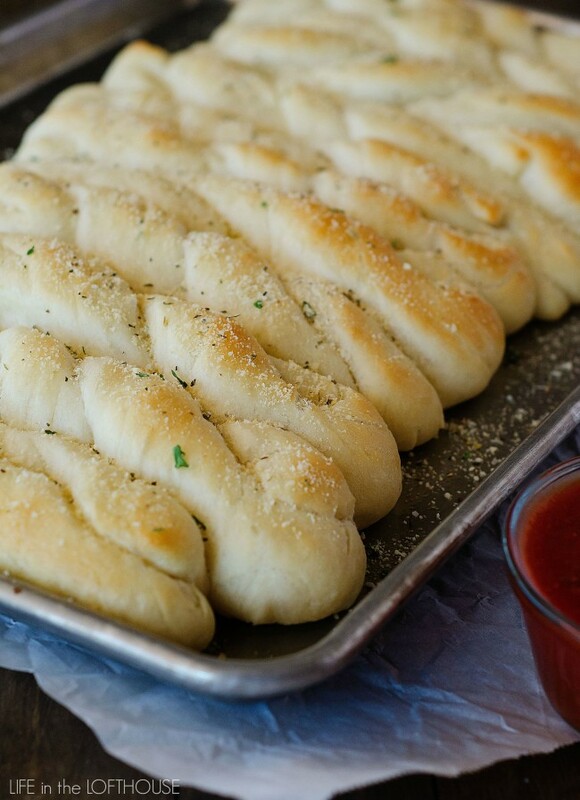 Adding too much flour will make the breadsticks too dense and not soft.) Cover bowl and allow to rise 30 minutes or until doubled in size. Remove dough from bowl and place on a clean and lightly-floured surface. Spray a large baking sheet with non-stick spray. Roll dough into a large rectangle, about 1-inch thick, and cut into 12 strips with a pizza cutter. Roll out each piece of dough into a long rope then twist. Place dough twist onto prepared baking sheet and repeat with the rest of dough, placing side by side on baking sheet. Cover and let rest 30 minutes to rise again until doubled. Preheat oven to 425° F. Bake 10 to 12 minutes or until golden-brown. Remove from oven and rub a 1/2 stick of butter over the warm breadsticks. Sprinkle tops evenly with Trader Joe's "Everything But the Bagel Seasoning" or top with Parmesan and garlic salt or the seasonings of your choice. Serve and enjoy!